There are times when you want something on the side. A side dish, of course. But it has to be quick. I do enjoy the different flavors of Bush’s Best beans, but I have to say I always augment them. This week I opened a can of Chili Beans with Hot Chili Sauce. They were not hot. Not at all. And they tasted, well, a bit too much like beans. 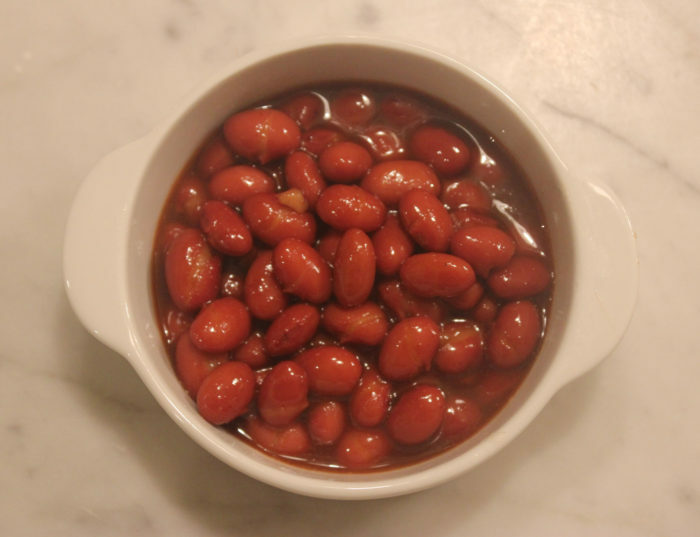 This is the simplest way to transform a can of beans into a side dish you’ll relish. A little brown sugar. A little hot sauce. You can adjust the amounts of sugar and hot sauce, but my recipe below is good starting point. It may seem like a lot of sugar, but you need to compete with the hot sauce. Now, hot sauces vary so widely that you really need to start with this 1 teaspoon, heat it all up and then taste test. In my case, I got to 3 teaspoons before I could feel my brow sweating. You don’t have to sweat. This should be a no sweat dish. But feel free to add more fire. The more fire, the more sugar you’ll want. Brown sugar, not white. Put the beans in a sauce pot. Add the brown sugar and hot sauce. Stir to mix a bit, then turn on the heat. Bring to a boil then simmer for a couple of minutes. Taste and add more sugar or hot sauce as your need.